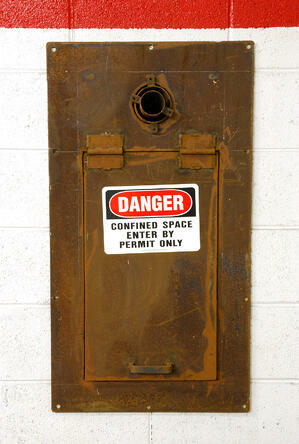 Examples of confined spaces include the following. 1. The training program should include all team members. All employees who work in and around permit-required confined spaces must be trained in order to acquire the understanding, knowledge, and skills necessary to safely perform their assigned duties.You must train the entry supervisor, the attendant, the authorized entrant, the atmospheric tester and all rescue personnel regarding their specific duties and risks. Each of these team members needs to understand their role in conducting a safe confined space entry operation and be proficient at all skills required to perform the job safely. whenever there is reason to believe there are deviations from the permit space entry procedures or inadequacies in the employee's knowledge or use of the procedures. A written record must be kept of completed permit-required confined space training and must include the employee's name, the trainer's signature or initials and dates of the training. 3. Training should be conducted by subject matter experts. 4. Test the proficiency of the entire confined space entry team through hands on application and documented testing to make sure they have the skills needed. 5. The training should be tailored to each team member's role to ensure that each team member knows their role, can recognize hazards and risks, and is aware of the effects and signs of an overexposure. A training certificate should be issued to each participant upon successful completion of the training.